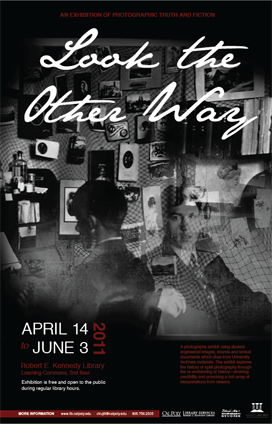 A photography exhibit using student-engineered images, sounds and textual documents which draw from University Archives materials. The exhibition explores the history of spirit photography through the re-envisioning of history — straining credibility and provoking a rich array of interpretations from viewers. Click on an image below to see the animated GIF in a new window. Two Men at a Desk. Women standing at a table. Yes! Thursday! It's 2:53pm right now.